Roger Ramos, who started Grow with the Flow with his twin brother Reggie Ramos, celebrates with other 2017 Start:ME participants at the end of the 14-week business accelerator program. Applications are open through Nov. 6 for the 2018 cohort as the program expands to include Atlanta's Southside. Yard space in Tucker has become the basis for a homegrown company, helped by an Emory program that gives a boost to small, start-up businesses. Brothers Roger and Reggie Ramos, who founded Grow With the Flow, grow vegetables in the yards of homeowners who have offered part of their land as garden space. The brothers do the planting, maintaining and harvesting. Homeowners, for their participation, get a weekly share of the produce before it is sold at the Tucker Farmers Market, online markets, Decatur’s upscale Cakes and Ale restaurant and local meal kit business PeachDish. Emory's Goizueta Business School chose Grow With the Flow to participate in Start:ME, a business accelerator program which provides access to early stage capital, mentors and business skills training to a variety of small business start-ups. Social Enterprise @ Goizueta (SE@G) partners with Access to Capital for Entrepreneurs, East Lake Foundation (East Lake), Friends of Refugees (Clarkston), Focused Community Strategies (Southside), and Purpose Built Schools Atlanta (Southside) for the Start:ME program. Launched in Clarkston in 2013, the program expanded to East Lake in 2015 and will grow to Atlanta's historic Southside neighborhoods in 2018. Applications for the 2018 cohorts for each community opened Oct. 1 and will be accepted through Nov. 6. Several information sessions for prospective applicants are scheduled through Nov. 4. “We are industry agnostic, so we work with small local businesses across all industries. This spans from Estonian rye breads to a Nepali grocery store, custom vintage eyewear to handmade leather bags, lawnmower repair to electrical services,” she says. Each community surrounds its 15 entrepreneurs with 25-30 volunteer business mentors. These hands-on coaches bring a variety of business skills — finance, strategy, law, operations — to the room and create a strong entrepreneurial ecosystem that business owners can draw upon during and well beyond the 14-weeks. Many of more than 60 business mentors are Emory alumni from the broader metro Atlanta area. Start:ME is currently recruiting interested skills-based volunteers to guide entrepreneurs during its 2018 programs. One especially interesting business in the program is Timeless Framework, a custom and vintage eyewear business, Igleheart says. “The founder, Lanard Atkins, has advised on movie and TV sets and specializes in truly unique pieces,” she says. Porter says she became aware of the Start:ME program through a mentor who had previously done volunteer work with refugee women starting businesses. Her original attempts to pursue a business in art, design and fashion were stymied by the prospect of having to manufacture products that did not meet her ethical standards of fair pay, environmentally friendly dyes and, when possible, organic materials. She was eventually able to manufacture her designs ethically and in a set-up where she could control the quality of the product. While her brand currently includes home décor products and wall art, Porter is moving into women’s clothing, based on the reaction she’s gotten from customers. Porter praises the Start:ME program's mentors and “great support system." Start:ME focuses its support around three pillars: business training, mentoring and early-stage financing. For each cohort, the program receives approximately 85 applicants in each community and selects 15 promising ventures, using a paper review and in-person group interviews. “As a result, we get those who really show a dedication to actively working on their businesses during the 14 sessions, actively building between sessions, and laying down their strategy for post-program,” Igleheart says. Having completed Start:ME’s 14-week program, alumni are supported with two programs, Build:ME and Connect:ME. One of the lessons for Start:ME: What the program teaches is most effective when directly applied to the businesses helped. “Every session we deliver business content (such as accounting or identifying your market), then allot a significant amount of ‘table time’ for the entrepreneurs and mentors working at their tables to directly apply the topic to their business,” Igleheart explains. “Our goal is for all entrepreneurs to complete the program with a clear and concise business plan including basic financials, a solid pitch and a strategy for moving forward with their business." Start:ME helped the Ramos brothers “pay more attention to details of our business plan, how to make connections with the media, and which avenues to explore for growth," Roger Ramos says. “We became more comfortable in explaining our story and emphasized our connection with the community," Ramos says. 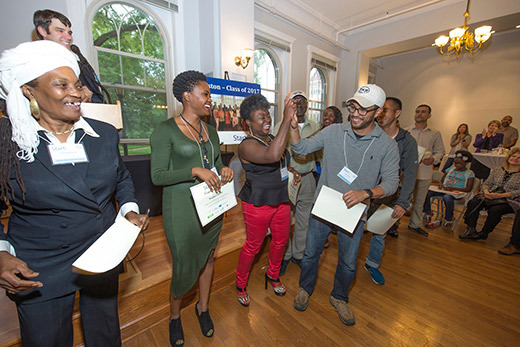 Find out more about the latest cohort of entrepreneurs’ graduation and loan investment.